Diving in the El Cabrón Marine Reserve on the east coast has developed such a reputation for the variety and quantity of marine life that it has not only been proposed as a marine reserve, but an underwater guidebook has already been produced by the local council. But it is not just the marine life which makes this area special for scuba diving, as the underwater scenery is stunning, with natural arches, caves, tunnels, swim-throughs and cliffs. From the main entry point there are at least four different dive routes, and altogether between eight and ten separate dives in the reserve. The underwater marine life is prolific, with huge shoals of Roncadores, damselfish, sardines, barracudas and other species such as bream, wrasse and parrotfish are common throughout the reserve. 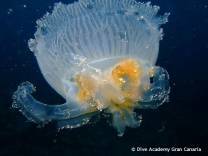 Every dive can throw up surprises, from rays, to sea-horse, from glass-eye to gorgonians. Despite the beauty and color under the water the reserve itself is at the end of a dusty 'off-road' track with no visitor facilities at all (no toilets, no water, no cafes nothing). The best dives bottom out at around 22m, and are 'multi-level' which means that if you are careful with your air you can get non-stop dives of 40+ minutes.